I've missed you! I thought I was only going to be gone a week or two but it's been almost a full month. I hope you will forgive me. While I may not have been here talking about it, I have been knitting. Not knitting as much as I'd like -that pesky job of mine tends to get in the way - but knitting nonetheless. Since my last post, I've knit a couple of hats, I finished the Blue Heron cowl and I started another 'faded' project. I'm actually much further along on it than the photo shows. Since taking that photo, I've added almost two more full skeins to it. I'm using the Sunstorm Hawthorne value pack I mentioned here. The first two colors coordinate but don't really 'fade.' The rest however.... At least so far, the other colors are blending perfectly. In fact, they blend so well that until I've got a few solid inches of the new color knit, I don't notice the difference in the yarns. To balance out that non-faded beginning color change, I'm saving the yellow skein for the other end. The yellow will coordinate but not 'fade' with the color before it. I think it's going to be perfect! The design is simple. So simple, I'm not sure I can legally call it a design. 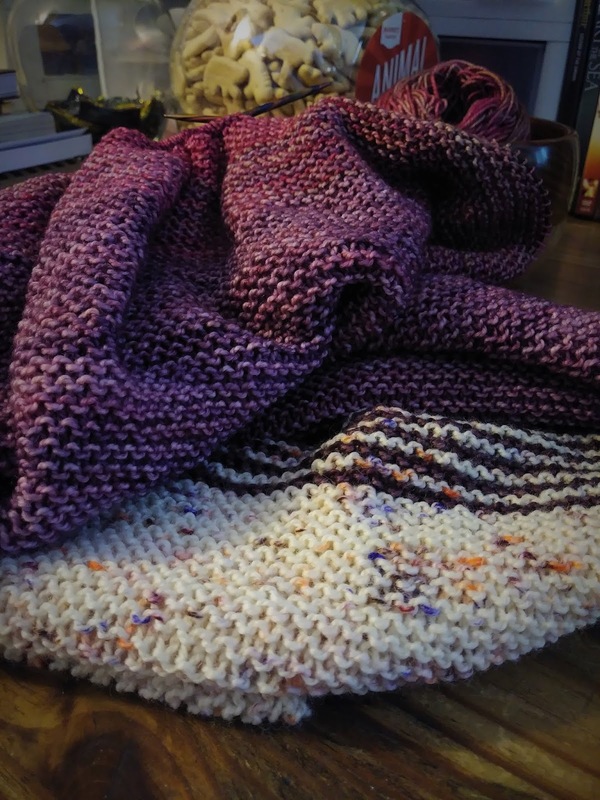 It's just a garter stitch rectangle with pointy ends. I started by casing on 3 stitches and increased with a simple K1YO at the beginning of each row. Once the shawl was wide enough (more like, I got bored of increasing,) I began doing a K1,YO,K2tog at the beginning of each row. Once I'm ready to decrease on the opposite end, I'll change it K2tog, YO, K2tog. I think it's going to work and again, I think the shawl will be perfect! 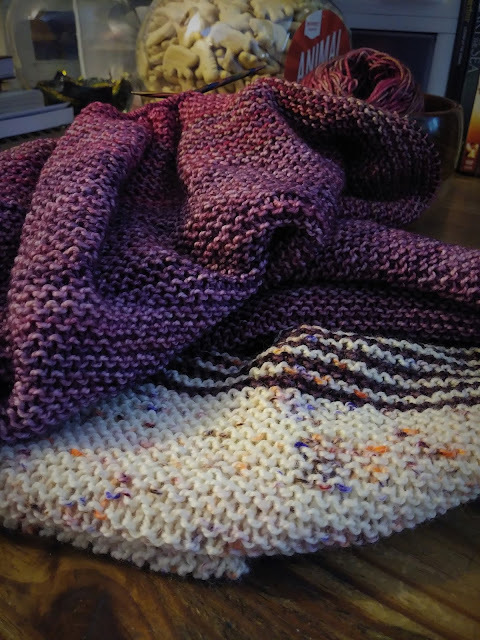 The simplicity of all that garter stitch is exactly what I've needed this summer. Hopefully I will have a more up-to-date photo to share soon. I can't believe my luck! Actually, I can. Today was a fairly typical day in my life. I finally had a chance to take a few photos of finished projects and... It was cloudy and late-ish afternoon, which means the house is not naturally well lit at all so I set up outdoors on the porch. I wiped down the deck railing, got the shawl laid across it just so, got the camera set up, waited for the lens to clear (It's about 4,000% humidity outside,) got the tripod set so that the shawl was framed perfectly in the camera lens, dealt with the wasp sting I got when I stepped back and my foot landed on Mr. Angry Wasp... I was finally ready to go and... Dammit! The camera battery was dead. And so was the back up battery. Double dammit! So, maybe next Saturday I'll get some photos taken. And yes, Next Saturday. Not This Saturday. Next Saturday is my next day off. So, once again, you may not be hearing from me for a while. Someone please remind me how much I love my job. Sorry to hear about the trouble you went through to end up without good pictures of that shawl. It is going to be beautiful though! Thank you! I really do love my job, I just don't love how much knitting time it steals from me. All your projects sound like fun! Good luck with finding time to knit around that job, that you really do love. I read the latest post first!